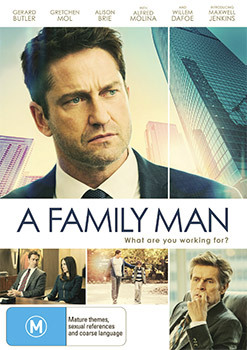 Thanks to Defiant Screen Entertainment here is your chance to win one of 6 x A Family Man DVDs, starring Gerard Butler. Synopsis: Audience favourite Gerard Butler leads an all-star cast in this first-class drama! Sometimes, having it all can have its price. Defiant Screen Entertainment is proud to present the outstanding drama A Family Man, the story of a man torn between professional ambition and personal circumstance. Dane Jensen (Gerard Butler) is a driven Chicago-based headhunter, working at a cut-throat job placement firm. When Dane's boss (Willem Dafoe) announces his retirement, he pits Dane against Lynn Wilson (Alison Brie), Dane's equally driven but polar-opposite rival at the firm, in a battle for control over the company. As Dane gears up for the professional battle of his life, he learns his 10-year-old son Ryan (Max Jenkins) is diagnosed with an illness. Suddenly, Dane is pulled between achieving his professional dream and his family, who need him now more than ever. The film also stars Alfred Molina and Gretchen Mol and is described by Producer Craig Flores as 'a passion piece, for everyone involved". Gerard Butler was attached to the film from the very beginning. Craig and Gerard had worked together before on the film 300 and he admired Gerard's earlier performance in a small, independent film called Dear Frankie, about a single mother and her deaf son. 'In taking on A Family Man, our goal was to revisit Gerry's work in that film, and use it as a touchstone for this one," Flores said. The script was written by Bill Dubuque, who after working 15 years as a corporate headhunter, turned to screenwriting, and poured his recruiting experiences into the screenplay. Bill exploded on the Hollywood scene when he wrote The Judge for Warner Bros. They later bought and produced his original script, The Accountant. He is most recently known for his work as Co-Creator and Executive Producer of the new Netflix series, Ozark, starring Jason Bateman. First-time director Mark Williams was drawn to Bill Dubuque's script by the quality of the writing and the authenticity of its voices. An accomplished producer (Flawless, The Accountant), Mark crossed over into the director's chair with full faith in his screenwriter and cast, and a complete vision for what he wanted: 'Simple, elegant, classic. A throwback movie. A family drama dealing with real-life dilemmas. The goal was to always respect the characters and the world in which they exist" said Williams. The script populates the under-explored world of corporate headhunting with characters confronting relatable and universal challenges: the balance between work and family, husband and wife dynamics, the father and son relationship, losing a job and finding a job. Williams said, 'Each actor could relate to their character or the situation on one level or another from their own personal experience. This lent the performances a truth, which shows up on screen. I gave the actors the freedom to try different things, to explore." In the editing room, he was then able to play with the different takes 'to balance the humour and heart the story offers." A Family Man launches on Blu-ray, DVD and Digital on October 18th, 2017.